The Memorial Candle Program has been designed to help offset the costs associated with the hosting this Tribute Website in perpetuity. Through the lighting of a memorial candle, your thoughtful gesture will be recorded in the Book of Memories and the proceeds will go directly towards helping ensure that the family and friends of Oliver Dulle can continue to memorialize, re-visit, interact with each other and enhance this tribute for future generations. Obituary for Oliver Anthony Dulle Sr.
Dulle Sr., Oliver Anthony, 98, Fortified with the Sacraments of Holy Mother Church on Thursday March 14, 2019. Beloved husband of 65 years to the late Mary “Connie” Dulle (nee Sandweg). Loving father of Mary (J.H.) Douglass, Paul (Suzi), Peggy (Deacon Dennis) Barbero, Cathy, Oliver “Skip”, Tim (Pat), John (Joan), Jeanne (Jim) Moore, Pat (Terry) Blevins, Rose (Dan) Harris, Beth (Ray) Kaiser, and Bill (Kelly). Dear grandfather of 37 and great grandfather of many. 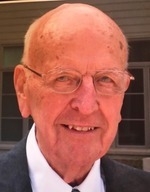 Oliver was a retired Executive of Union Electric (Ameren). Funeral Mass Monday March 18th, 10am at Immacolata Catholic Church. Interment Calvary Cemetery. Visitation Sunday 2-6 pm Bopp Chapel.